The Em Rex Cover is used with the Em Rex® Unit to deter unintended / malicious activation of the unit when it is installed in a public area. The unit is passive and has no electronics that could fail and cause the unit not to operate. The Cover has two sets of outputs which are used to monitor the operation of the cover being lifted. One set of contacts connects to the piezo (buzzer) input on the Em Rex® unit and the second to the Access Control System for monitoring. 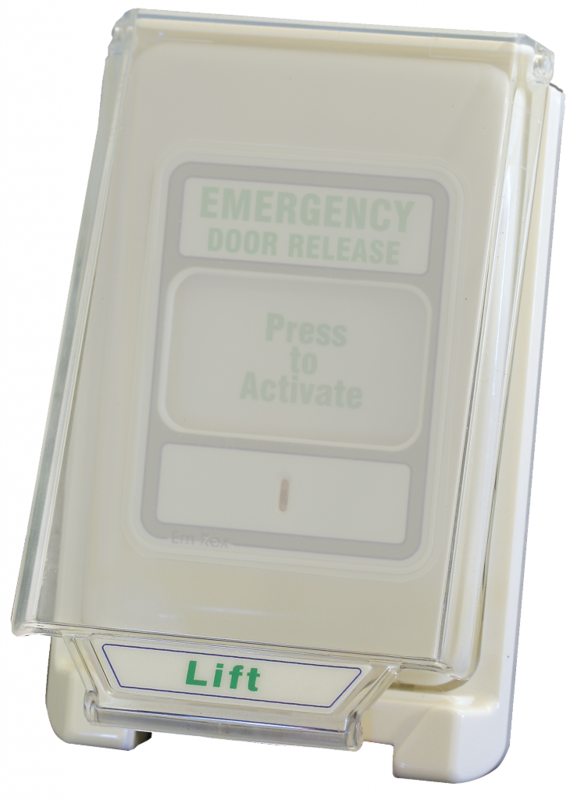 The cover is designed to clip into place when closed, to make the operation of it a deliberate action, as it will not lift without reasonable force. This will prevent any accidental or unintended operation of it. The Em Rex Unit fits into the base of the cover before both parts are fixed to the wall, preventing it being removed without unscrewing it from the wall. It is also available in an un-monitored form if no indication of activation is required. The Em-Cover is secured behind the Em Rex® Unit to prevent removal. The cover is designed to latch closed so as to make the operation of it a deliberate action. The cover is made of polycarbonate so as to withstand long term operation without any deterioration. Text and graphics will not deteriorate over time and the unit is easily cleaned.